Gripping Stuff Notice Boards now come with antibacterial protection. 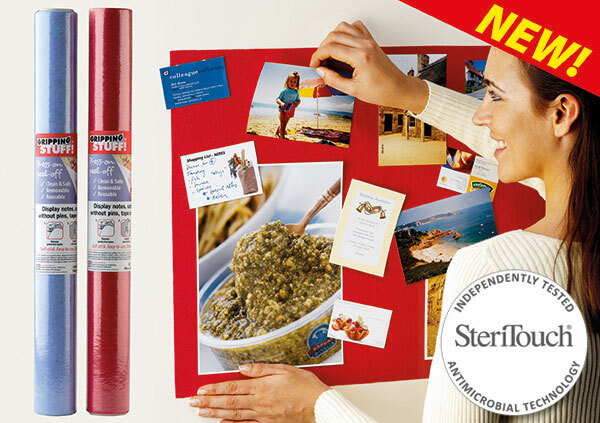 Unable to wear off or wear out, SteriTouch anti-microbial technology is added to our adhesive to create a permanent barrier against a range of bacteria, biofilm and mould, proving 99.9% effective against MRSA and E.coli bacteria on the Gripping Stuff notice board after testing. A hygienic alternative to traditional notice boards, our new board will allow healthcare and education settings to display important information without raising concerns over cross contamination. Ideal for GP and dental surgeries, nurseries, care homes and other hygiene-sensitive areas, Gripping Stuff notice boards display your notices and memos without the need for pins, oily-tack or tape, leaving the walls free of marks and holes. That uplifting ‘Get Well Soon’ card or that beautiful art display can be displayed safely and cleanly without concerns about bacteria or marking the walls! C O M P E T I T I O N!